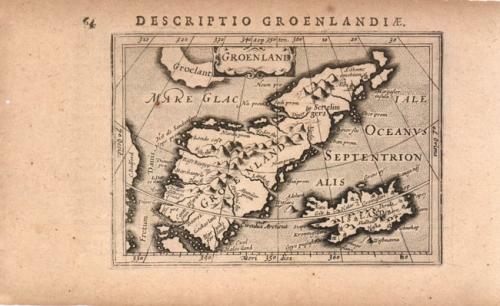 This handsome miniature map is one of the first maps to focus on Greenland. The island is shown as a narrow island with a central mountain range. Across the Fretum Davis is C. Bedford. Iceland is also shown with an erupting volcano. Decorative title cartouche. Latin text on verso. Toned with a few tiny wormholes in blank margins and one insignificant spot in the sea.